When you want the tourist experience of visiting a major city, navigating the area with kids in tow can be difficult. 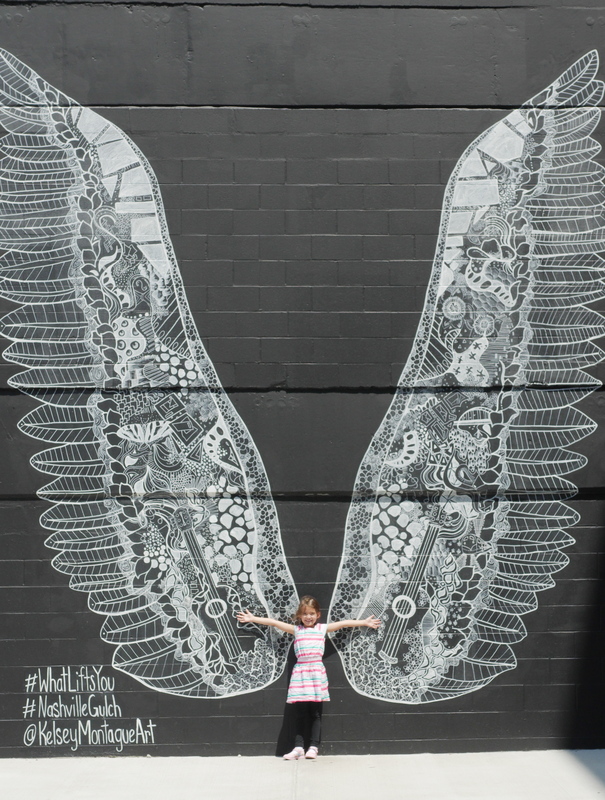 Nashville, Tennessee offers a large amount of kid-friendly attractions, and even though downtown Nashville isn’t well known for its kid-friendly places, there are actually many places to stop if you visit with kids. 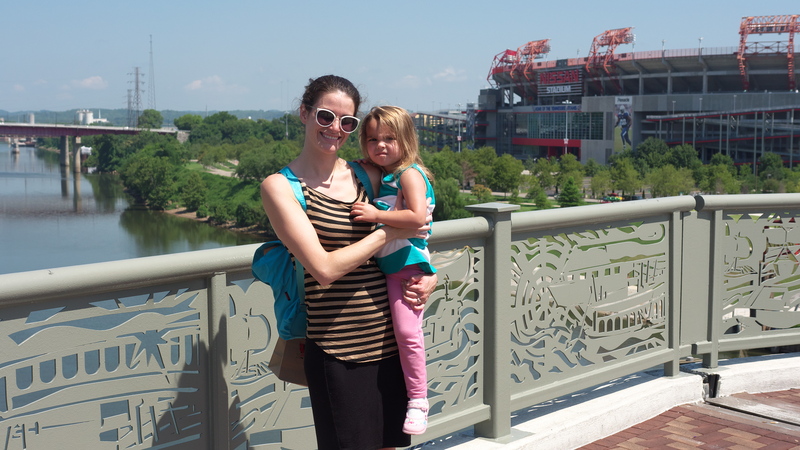 Usually, downtown Nashville is known for its honky tonk and late night concerts, but there is much to do there even in daytime and with kids. These four places will give you the tourist experience, while still giving the kids an experience they can enjoy. First, one of the most quintessential views of Nashville is the skyline from the John Seigenthaler Pedestrian Bridge, also known as the walking bridge. This bridge is ideal to visit with kids because you don’t have to worry about them walking near traffic (except for the occasional biker). To ease your worries even further, the railings are tall and look sturdy. If you park across the river by the Nissan Stadium at an off time when the Titans aren’t playing, you can easily get to the bridge with the elevator. As you look out from the bridge, you can see the Nissan Stadium where the Titans play, the Cumberland River, and the AT&T Building (also known as the Batman Building). This is one of the most picturesque locations in downtown Nashville. I loved the view and so did the kids, even though Georgie was getting fussy because of the heat. If you are dressed casually or have bathing suits with you, there is a fun water park at Cumberland Park where the kids can cool off and play. You can get to the water park if you walk past the elevators from the Nissan Stadium. There are a lot of families playing in the water, but it wasn’t overly crowded. Walking around lower Broadway is a traditional spot for tourists to visit in Nashville. You can stop at numerous souvenir shops to pick something up to bring home. Some souvenirs you will find include boots, hats, belts, Opry memorabilia, and more. Kids of all ages will enjoy looking through the shops and finding something to bring home. 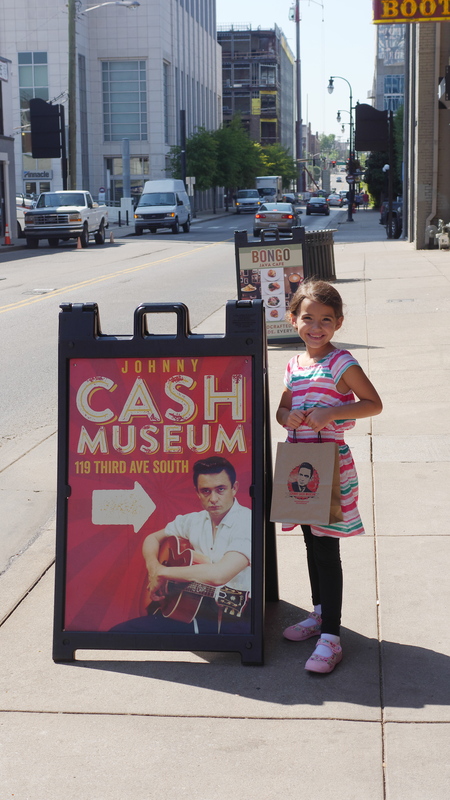 Another fun place to stop is The Johnny Cash Museum, where you can see a classic collection of items that tell the story of Johnny Cash’s life. 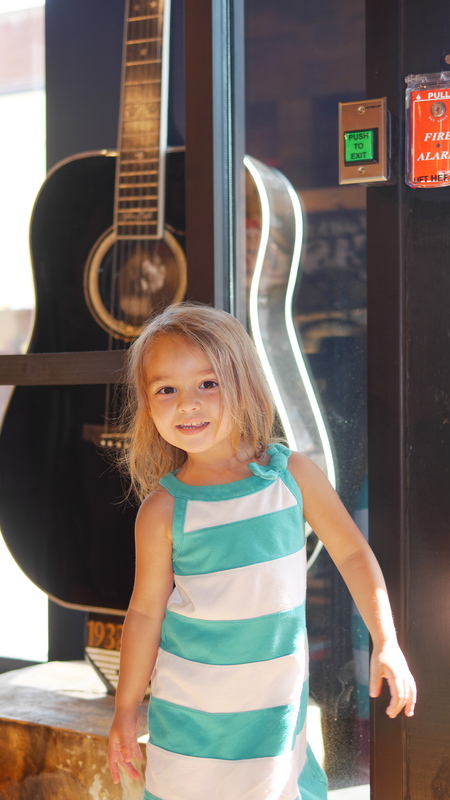 Visiting the museum is a neat way to show kids the meaning of the name Music City. Understanding the musical heritage of recording, writing, and performing is educational and fun. The museum is not a far walk from the walking bridge. Even preschoolers can manage walking this small distance, although a stroller would work fine on the wide sidewalks too. Inside, you can find Johnny Cash merchandise, such as retro shirts, onesies, and playing cards. You can find gifts for the whole family. As you shop, this is a good place to pick up a postcard to mail back home. Something nice about the Johnny Cash Museum is that it has the Bongo Java Cafe where you can get coffee, cookies, muffins, and other snacks. This is a nice place to cool down and rest before heading out to walk more. There is a reasonable amount of seating and the staff is very friendly. Located just a short drive away, The Gulch is located between downtown and midtown Nashville. You can find many places to shop, such as Two Old Hippies, where you can purchase clothes and acoustic stringed instruments. There is an Urban Outfitters as well as some small boutiques, including e.Allen Boutique and Blush Boutique. This is a nice place to visit for upscale restaurants, but there are also more budget-friendly choices for families. Stop at the Turnip Truck for fresh, local ingredients as well as grab-and-go foods and juices. In the heat of the summer, a fresh smoothie and a dish from the salad bar can taste amazing. For a quick, inexpensive Greek meal, stop at Taziki’s Cafe. You can get delicious Greek salads, gyros, hummus, and other mediterranean specialties. The large feast plates come with a hearty helping of meat and cost only around $10. You can find plenty of vegetarian options as well as kid-friendly plates, like chicken roll-ups, grilled cheese, and the mediterranean turkey melt. For a dessert, the baklava is spectacular and flavorful. Around the corner from Taziki’s Cafe is a beautiful mural that I learned about from Nashville-based blogger Greta Hollar’s post More Nashville Murals You Should Visit. Nashville is not only known for its amazing music, but also its art. The kids loved seeing the angel wings and pretending to have wings for a photo shoot. 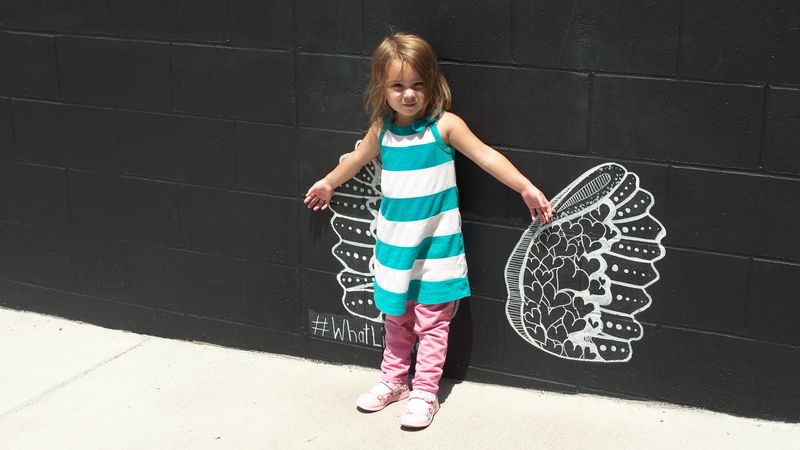 The second time we visited the mural, there was a small line of fashionable people waiting to get their photos taken, but everyone was very patient as my kids played there. This was a very fun place for the kids to stop. Now you have four great kid-friendly places to visit. 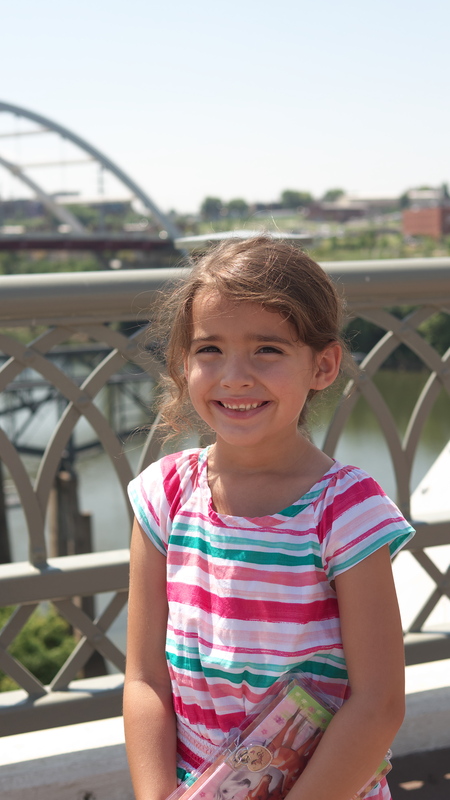 Downtown Nashville might be known for being a fun place to go out with friends for a night on the town, but there are so many opportunities for kids to enjoy the experience too. 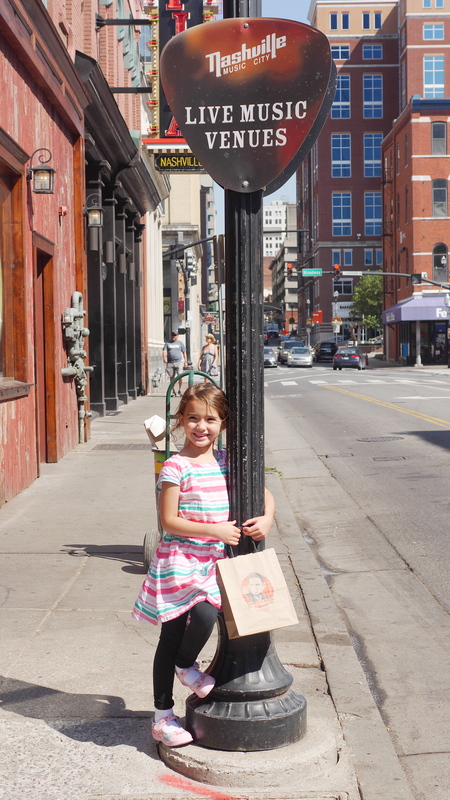 Have you been to Nashville, and if so, where would you recommend for kids to visit? For more travel tips and parenting ideas, follow me on Facebook, Twitter, Youtube, Instagram, and Pinterest. I love Nashville! I haven’t been in years but this brings back memories! Excellent recommendations! Nashville is on our list of places to visit and after seeing these pictures I am itching to go! Love the murals! Ypour girls are too cute! I went o Nashville in HS but now I definitely want to go with my boys! Johnny Cash would be a must visit. Picture of wings is really cool. I took a girls trip last year to Nashville and it was so much fun! I need to go back with my littles! Love that photo wall! Pinning this, thanks! Thank you. I didn’t think there was anything for my Grands to do in Nashville. I was wrong.